There is an assumption among these reformed partners that Baptism is the necessary and natural Sacrament of inclusion into the Body of Christ. Once included in that Body, the reception of Holy Communion becomes a means for strengthening that union and being drawn evermore to the Holy and formed in the likeness, mind, and will of Christ. This, of course, does not include the clear teaching of Rome and the Orthodox on the relationship between the Sacraments – nor our own century after century of tradition. One of my great worries about Communion without Baptism is that it undoes the very work that undergirded the Book of Common Prayer’s approach to the Christian life – that Baptism is the full inclusion in the ministry and Body of the Church. That baptismal ecclesiology is drawn from the depths of Christian tradition. The mystery of Baptism echoes the essential mystery of creation – that all is beloved of God. Earth and Heaven – Humanity and Divinity – are joined in the perfect offering of God in Christ. The Creation is made and God calls it good and yet we stray from the love of God and are called back through the grace of Christ at the font. The mystery of Baptism is that we can be one with the perfect love of Christ offered and poured out for us. It is that mysterious union that prepares us for a life of union – of Communion – with Christ Jesus. This is our Sacrament of full inclusion. It is this fundamental shift in our very being, our welcome as citizens of the Kingdom, our washing for the feast that frames the fullness of the grace offered in Communion. Baptism is communion with Christ’s death which welcomes us to Communion with Christ’s living Body which draws us to the perfect wholeness of Christ’s Resurrection. S. Ambrose wrote, “See where you are baptized, see where Baptism comes from, if not from the cross of Christ, from his death. There is the whole mystery: he died for you. In him you are redeemed, in him you are saved.” Baptism frames the totality of life with the Holy. Neither Baptism nor Communion are simply means of welcome. If they are simply this then they are deadly for they do not call us to new life – to reconciliation with one another and Christ. The Sacraments are not about our action they are about God’s welcome into the redeeming life and death of Christ. S. Augustine says of Baptism: “The word is brought to the material element, and it becomes a sacrament.” This is the essence of the Sacramental life. Matter is transformed and so are we. Michael Ramsey spoke of the priestly vocation as being called to be a “walking Sacrament” showing forth the transformative grace of the Spirit. This is the essence of the priesthood of all believers – to be walking sacraments upon whom the Holy Spirit is poured forth in an act of perpetual new creation. We assume that we know what is best for them because we see “hospitality” as the highest virtue when God is calling us to transformation – utter and profound self-offering which begun at the font when we don Christ and ever-continuing as we join our humble offering to Christ’s great sacrifice. By not doing the hard work of truly welcoming people, by sharing our deepest belief about the transforming power of the Sacraments, we do a profound disservice to good people, friends, neighbors, and those who simply feel some compulsion to come forward as everyone around them does. We impose an encounter with the life and death of Jesus Christ – participation in the crucifixion and resurrection – without truly sharing just what this means for their life, their being, and their soul. That beautiful prayer from the Vigil shares our baptismal and Eucharistic hope, “O God, who wonderfully created, and yet more wonderfully restored, the dignity of human nature: Grant that we may share the divine life of him who humbled himself to share our humanity, your Son Jesus Christ our Lord.” Baptism is our welcome into the restoring work of Christ. God did wonderfully create and He is ever more wonderfully restoring us. That work is incomplete and requires our participation – our active yes to God. That is one of the miracles of the Incarnation. Mary’s “Yes” was part of the indwelling of God. Our yes is part of God’s dwelling in us. Grace is ever offered – objectively present. But our reception of that grace, that indwelling, is a vital piece of the salvific action. All of this is offered and expected in the act of the Eucharist. It is profoundly and deeply unwelcoming, inhospitable, and unkind to fail to share with those who come to the Table God’s deep promise and concomitant expectations. The very words we use at the crux of the liturgy declare its intent, “Do this in remembrance of me.” What are we called to remember? Do those coming to the Altar see that Christ offered this Sacrament on the night he was betrayed – as his Passion was to commence – so that we could evermore find his Presence? Do those coming to the Altar see this as a sign and pledge of that Love? Do they want to remember continually his sacrifice? Are they desiring a spiritual sharing in his risen life? Are they seeking and hoping to be one with Christ? To be one Body with Him and members of one another? 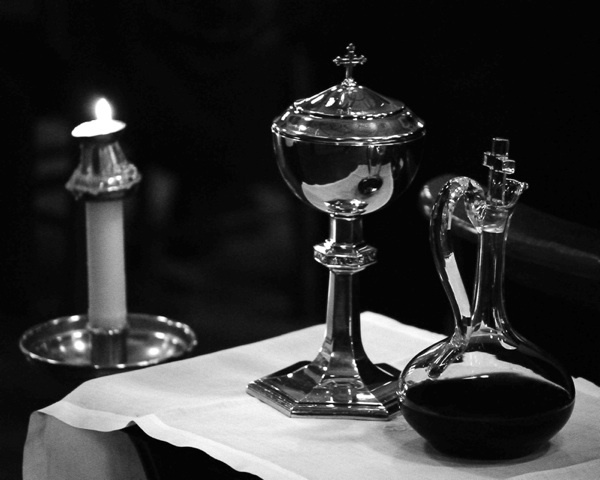 Are we being honest – fully open and deeply humble – about the hope and risk of the Eucharist? It is a risk for it asks us to offer all that we are so that we can be transformed into all that Christ calls us to be. The Eucharist is not a right. It is a gift of responsibility. It is a call to a life of holy witness, transformation, sacrifice, hope, striving, and ultimately of Resurrection. God’s radical welcome is simply this – come and die. Come and be re-born. A Church of radical welcome will preach, teach, and live in the shadow and light of this radical promise. I agree that to allow the unbaptized to receive Communion as a matter of policy would not be a faithful, hospitable or meaningful practice. But part of the problem stems from the fact that many baptized Christians themselves do not have a deeply meaningful understanding of the Eucharist t but only an emotional attachment without sacramental depth. And then it becomes easy to take the further step of thinking that it would be a good thing to share something so pleasing with others, who could experience it at the same emotional level. The real problem is that the church has not formed Christians into a fully sacramental and Apostolic understanding of the Eucharist. Just wanted to say I am very much enjoying all of your posts! They are inspiring deep thought and prayer in me. Thanks for sharing your thoughts on this topic. I’ve noted in one of my own blog postings that making the move to communion without baptism entails a rejection of the 1979 Prayer Book’s core theology of baptism: http://creedalchristian.blogspot.com/2008/05/communing-unbaptized-some-preliminary.html. The implications of such a move are staggering, and would do great damage to the Episcopal Church (which is already suffering enough from institutional decline). It’s as though, in the name of inclusion, we’re pushing to have little to nothing to include people in at all!